Astro-E2 dressed up with golden costume. 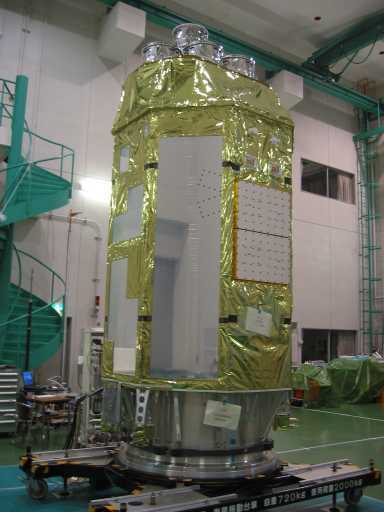 This gold film is called MLI (Multi-Layer Insulator), and maintains the temperature inside the spacecraft in the space environment. It is a very important costume to protect the life of the spacecraft. 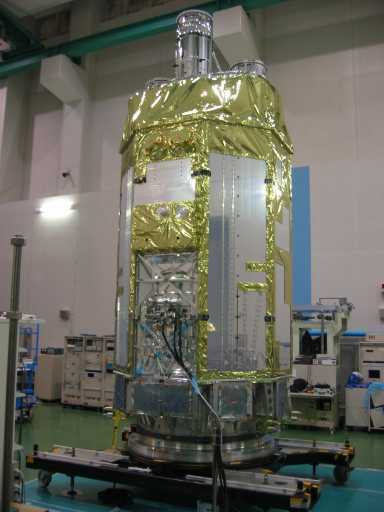 Photo 1: Astro-E2 satellite with MLI. The left picture is the front side, and the right picture is the back side. The silver boards on the side panels are the radiators. Photo 2: Astro-E2 from on high. Components with cylindrical shape on top of the spacecraft are the X-ray telescopes. Two racks in front of the spacecraft are monitoring the temperatures of liquid helium and solid neon used in the dewar of the high resolution X-ray spectrometer (XRS).